It's the best out of all the others I've tried. Good design, and snappy UI. After I lost my sweet sweet Alien Blue, I didn't know what to do. But then Narwhal came in and blew the other snoos into the bufoo. 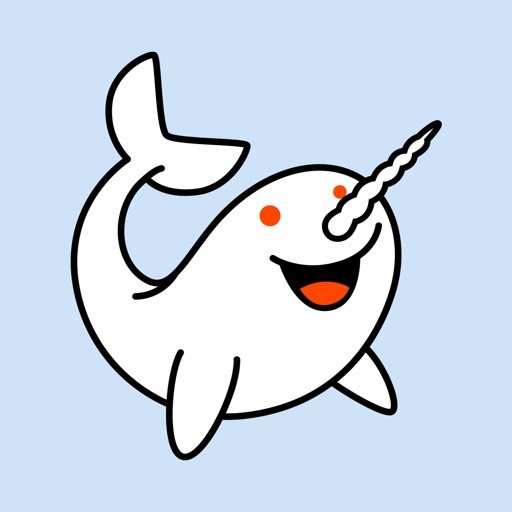 Honestly though Narwhal is the best Reddit client out there. Narwhal is so close to being perfect. But I can't give 5 stars because of some glaring things that stand out. The app mostly works great, but loading comments and threads can get stuck throughout the day. Also switching comment order and refreshing comments is not ideal, but I must say that swiping to the side for automatic up/down votes / edits / etc. is brilliant. If you combined the swiping side to side, refresh by pulling down, and easy switch in comment order, this would be the best app for (sports) game threads. I felt like the reddit app was going downhill, and was honestly about to forgot it altogether. And then I found this beautiful version. Love the utilization of swiping, seems to refresh faster, and seems to just have a all around better interface. Honestly, I'm a little drink which is why I'm writing this, but tho honestly tho, it's a great app. You should download it. If you like Reddit. If you're like I was, downloading a bunch of apps trying to find a solid way to browse Reddit on your iPhone/iPad; you definitely need to try this! Trust me, I've tried them all & Narwhal is by FAR the best! It's never crashed or froze, looks great, & I can't think of a single function it's missing! Highly recommended.